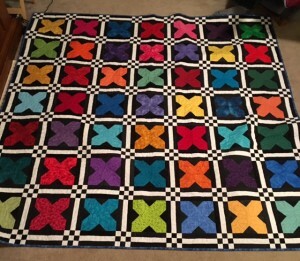 The finished X blocks quilt. This was given to a niece for Christmas. She loved it! Thank you to everyone who helped make these blocks! Terrific setting idea for this block. I’m sure your niece will treasure it. Of course she loved it–it’s wonderful! Great setting. what a wonderful quilt! great layout! Love, love, LOVE what you did with these blocks. The black/white checks really make those colors pop! You’ve been very busy. What a great setting – makes me want to revisit that block pattern. Wow! What a great quilt. I love the checkerboard medallions and the bright colors. Love it!